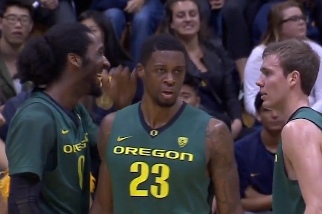 The growth of this Oregon basketball team continues to surprise and impress the Duck fan faithful. Last night in Haas Pavilion our beloved Ducks responded every time to a potential run by Cal as they hit key shots down the stretch and made 10 of 11 foul shots at crunch time to seal the win, 80-69. This simply did not look like a team that could have a few newbies hitting the “freshman wall” as they showed a grit and toughness that was thrilling to watch. Benjamin, Cook, and Benson savor the rare win in Haas. Dwayne Benjamin had a double-double with 18 points and a monster 10 rebounds to help lead the Ducks, although even he was surprised at his good shooting. He has matured into a complete player for Oregon who can hit the big threes and bang on the inside for rebounds. He is an example of the players on this team who have been working hard to improve as the season has progressed and he now has the confidence to go for the big baskets and plays. Joseph Young put on a wonderful show of athleticism as he was the game high scorer with 25 points, and Dillon Brooks grabbed 10 rebounds to help the Ducks beat Cal for the first time in thirteen attempts. Elgin Cook ignited the team with slam-dunk among his 17 points to help pace the team. To make the NCAAs — Oregon needs to win two of the final three games, thus last night’s victory over Cal was so crucial. On to Stanford Sunday night!